•	Passengers can get involved with sailing the ship and pulling the ropes. •	Spacious accommodations and expansive teak decks and 2 swimming pools. The Federation of Saint Kitts and Nevis also known as the Federation of Saint Christopher and Nevis), located in the Leeward Islands, is a federal two-island nation in the West Indies. It is the smallest sovereign state in the Americas, in both area and population. The capital city and headquarters of government for the federated state is Basseterre on the larger island of Saint Kitts. 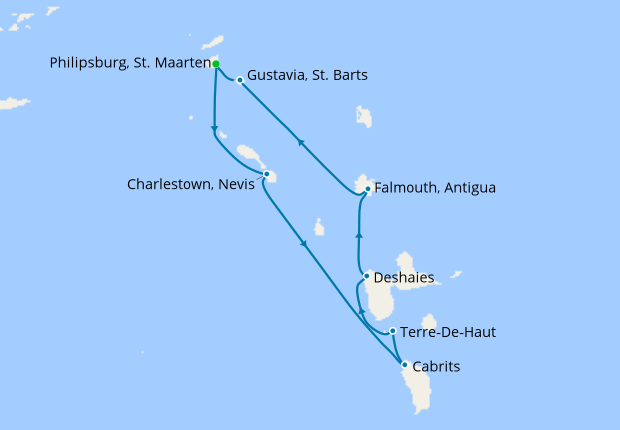 The smaller state of Nevis lies about 2 miles (3 km) southeast of Saint Kitts, across a shallow channel called "The Narrows". We wanted to try the small boat experience. Wind in the sails etc. Freedom. What happened was unexpected and not very good. Worse parts first I think - which may take a while. The sails only went up when the boat was becalmed and not moving. Then only for short periods to take photos.So travel was by engine - noisy and smelly. We missed one important port due to weather conditions. Larger boats didn't have this problem. The substitute port was of no interest to us. Little to see, no maps or information. No excursions organised or even ideas on what to do or see. There was no time or research or plan. We were just dumped. No internet access to research ourselves. Lack of professionalism and unfriendly staff. It was obvious that no one really cared if we had a pleasant voyage. The staff were terrible in some cases. There was a lack of language proficiency. German was the main language. English and French and other speakers were badly treated. There was a large group of German travel agents onboard and all efforts were made to make them happy. The staff ignored the rest of us. There was no "sail away" from ports with music and sails. On departure from Athens it was pitch black on deck. Very crowded and no one could see or knew what was happening. I think I could vaguely hear the famous Vangelis music but although I walked around the deck it didn't get any louder. Staff were only there to sell champagne. The dining room was too cramped and full. Staff canteen feeling. Staff didn't engage with passengers, We sat with a delightful French couple one night and tried to find other french speakers for them. Asked the Maitre D' but he didn't bother to even think about it. Summed up the voyage I've saved the worst for last. Embarkation was easy but we were told to wait on deck for the safety talk. I'm guessing that the cabins weren't ready and they wanted to "manage" us there. Waited and waited. Sickly cheap drink offered. Eventually gave up and found our cabin. No map or introduction to the boat or schedule was given to us on day 1. Staff were here and there but no talking or engaging with passengers. They were mainly Filipino with poor english. Returned later for the safety talk. Disorganised mess. There are simply not enough European speakers there to manage the amount of passengers. Not enough space to do this properly. If that wasn't bad enough we had to sit while a staff member went through a long rambling talk in German, English and French. Went on and on. We can only hope that her German was good as the rest wasn't. All the briefings on deck were like this. Long, long waits. Long, long mangled talks that were often unintelligible. We wasted so much room waiting and enduring these. When we were on deck there was no where to sit and enjoy the feeling of the sea air. All seats were taken early and aggressively defended and were too few for the number of passengers. We had to stand or stroll but that was hard given the number of people packed into such a small space. The public rooms had very small windows and missed the sea experience. We didn't dock in ports. Apart from Athens all were done by tender or even zodiac. Now for the good bits. We found prices for drinks very reasonable. There was a great cheap laundry service. Food was plentiful. It was easy to move around the boat even for those with slight mobility problems. Not suitable for wheelchair users but there were plenty of elderly and/ or walking stick users. We did like our small but very comfortable cabin and the whole boat was very clean. I was lucky enough to be invited on Star Clipper in Malta this summer, and must confess was blown away by the combination of luxury cruising and a 'proper' sailing experience. 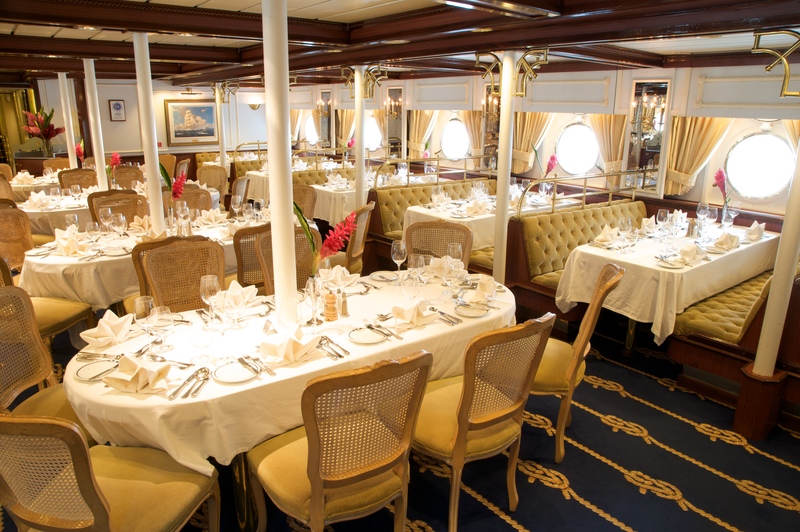 Like larger cruise ships, Star Clippers still feature high quality dining, complementary tea/coffees, well appointed cabins and a wide range of excursions. The huge difference here is the nature of the sailing experience - many guests enjoy hoisting the sheets and climbing the rigging, for some of the most rewarding views at sea. 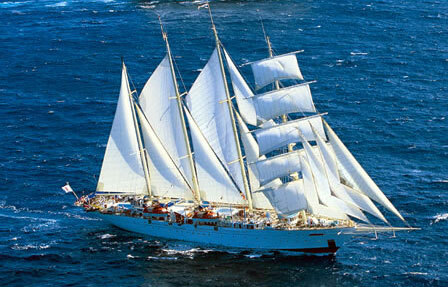 Sailing through the Caribbean or Med provides a relaxed and confortable sailing experience - whereas one of the transatlantic crossings (which are the first to sell out) are a uniquely enriching holiday experience best suited to those experienced in ocean sailing. In short - this is a unique and enriching cruise experience - ideal for those looking for something different!